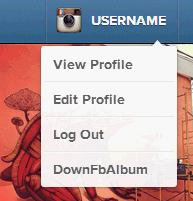 Summary: Download Facebook & Instagram Album by One Click. for my script to work in https environment. If it isn't work in Opera & Safari, please wait for fixes. After installation, please refer to this guide to save photos. Go to any albums/photos tab in profile. 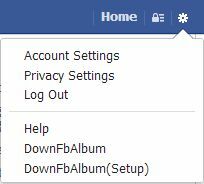 Click the link 'DownFbAlbum' in the top menu. Save the new content loaded. "Press Ctrl+S"
Memory usage may greatly increase after downloaded too many photos. For **Chrome: Slow performance during scroll up&down is normal. Due to unknown bug, some images may cannot be loaded you can save the page first. All images will be downloaded but you may need to click ReStyle and save the page again.